Leads and slugs and spacing... oh my! Leads, slugs and spacing are the mortar to all well-built type forms. And just as in construction, incorrect usage can bring otherwise solid bricks crashing down. Leading is the space between lines of type, and it is commonly found at 2 points thickness. It is also possible to find 1, 3 and 4 point thicknesses (tip: I've been known to use 80lb cover weight paper as 1 pt. leads.) When leading is 6 points or above, it is then called a slug. Lead and slug racks often have divided space for each, with leads on top and slugs beneath. Slugs can also be found in thicker sizes; I keep these in a drawer so they don't take up all the space in the rack. Leads and slugs can be trimmed by hand or with a saw. Both work great; they need to fit within a composing stick snugly at your desired length, but not so tight there is bowing. The top stick below shows hand cut leads and slugs (using a slug cutter, a staple all shops should have) and the bottom ones were trimmed on a saw. If you plan to add leading to your form after removing it from the stick, be sure to test that it fits within the SAME stick before you then add it to the form on a galley. There can be slight variations in old sticks, especially if the knee (the movable piece) and main section do not have the same serial numbers. I've often said that spacing is what separates us from the animals. Understanding it is the secret to excellent typesetting. Before breaking the bank on 19th century eBay type, consider investing in spacing. Otherwise, that glorious type won't be put to use! 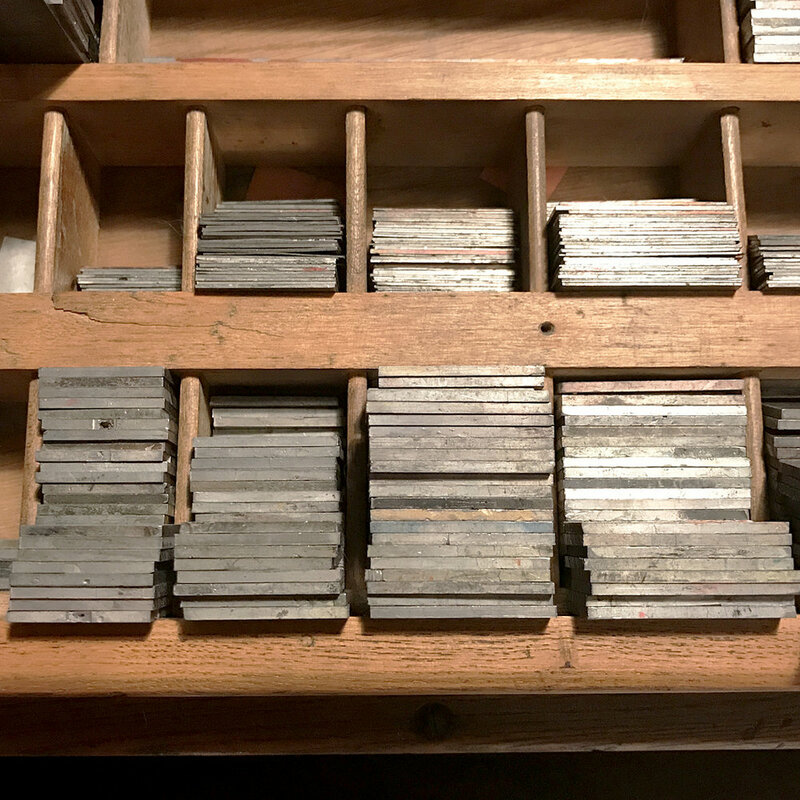 I recommend ordering from M&H Type Foundry, after checking your collection to figure out which sizes will be most useful. Or hit those letterpress swap meets and buy a coffee can full! We'll save letterspacing for another day! In the meantime, don't be lazy; get the correct spacing in a range from thin coppers and brasses to em quads and 2-em quads for each size you plan to use or based on what size type you have in your collection. I have found it very helpful over the years to consolidate all spacing into separate containers by size instead of storing it within the type cases. This way you can easily move it to wherever you are setting type and you don't have to dig through all the 12 point cases to find a handful of coppers. Ours are in old wooden boxes but new-fangled plastic dividers work great, too. So do those small, metal hardware containers found at hardware stores. When you have the correctly-sized leads and slugs as well as spacing prepped and ready to go, your typesetting speed will increase exponentially.